I was out of room. 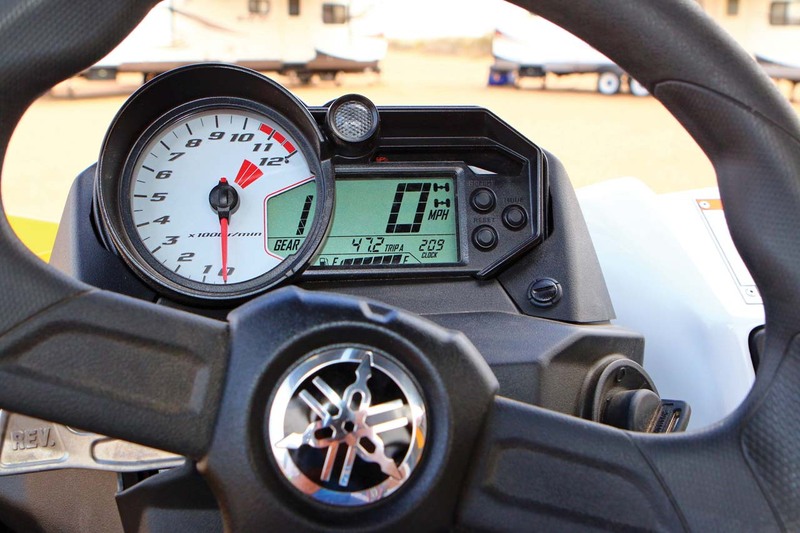 There are over 150,000 acres on the California & Arizona border in the giant sand playground known as Glamis and yet I was hurtling towards the line at where I would have to lift my foot off the throttle before completing my top speed run. A moment ago I had come charging down an enormous sand hill parallel to Interstate 8 and the Mexican border, shifting gears on Yamaha’s new YXZ 1000R as the engine screamed towards 10,000 rpms. Second gear passed quickly midway down the hill, 3rd came and went a moment later, and in 4th things got blurry as I crossed the flats and sage brush raced towards my front bumper. 5th gear would lie somewhere beyond the brush line, but charging into the ever narrowing trails that wind through the brush is the proverbial recipe for disaster. It would be all too easy to meet with another rider like two bullets that collide across a battlefield, and at a possible closing speed well into triple digits, we would most likely not be going to the hospital. It was time to lift and make another run. You have to think of the Yamaha YXZ 1000R as a racecar for the sand. At times it can be hot, loud, and it vibrates below 5500 rpms. It also engages all your senses, it’s ridiculously fun, and any sins are quickly forgiven as you work up through the gears. It reminds us very much of a high performance sport ATV, albeit with a steering wheel rather than handlebars. Both demand you have some skill, and reward you based on your own abilities. With the YXZ the test and the reward experience begins the moment you climb inside. 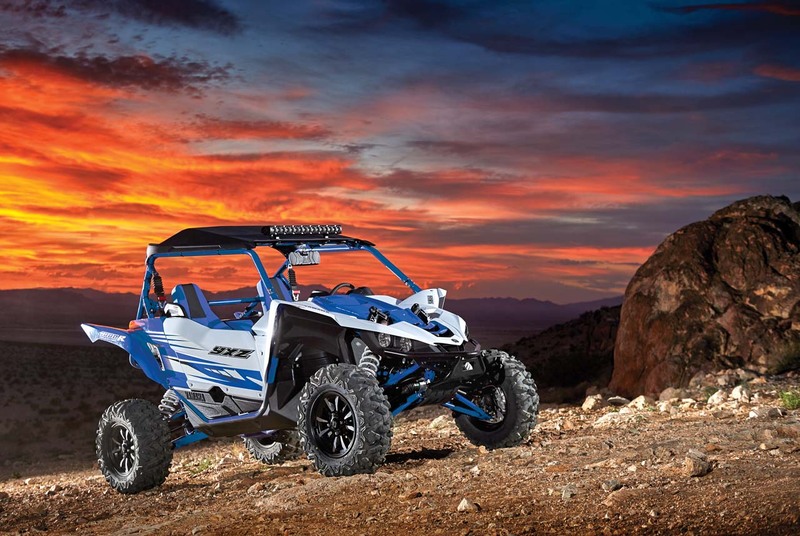 Yamaha did a great job on styling the new YXZ 1000R both inside and out. We really appreciate the cockpit-like design and all the surfaces have a premium feel with tight seams that fit well together. On the steering column is a display with a needle style tachometer which is very cool to watch as it approaches 10,000 RPM. Right next to that is a digital display with large, easy to read numbers and plenty of other information. We don’t expect you’ll be looking at it much while underway. One very nice feature is a shift light that pops on whenever you need to change gears. This feature is straight off their top-of-the line sport bikes. The steering wheel also has a nice rubber coating that feels great in your hands, and it has very little flex. We like it. Yamaha wisely put the sequential shift lever just off the steering wheel for a short movement with your right hand. Behind the shift lever are a couple knobs for 2wd/4wd/diff lock, and the lights. Ahead of the passenger is a contoured and rubber coated hand hold which doesn’t rattle around, and a glove box with a door that actually stays closed! Down below there is plenty of room for your feet which is important because this is the first Side x Side with a clutch. Both the driver and the passenger also get an excellent, extremely comfortable seat with a textured cover. Overall the interior styling on the YXZ 1000R is very, very good. 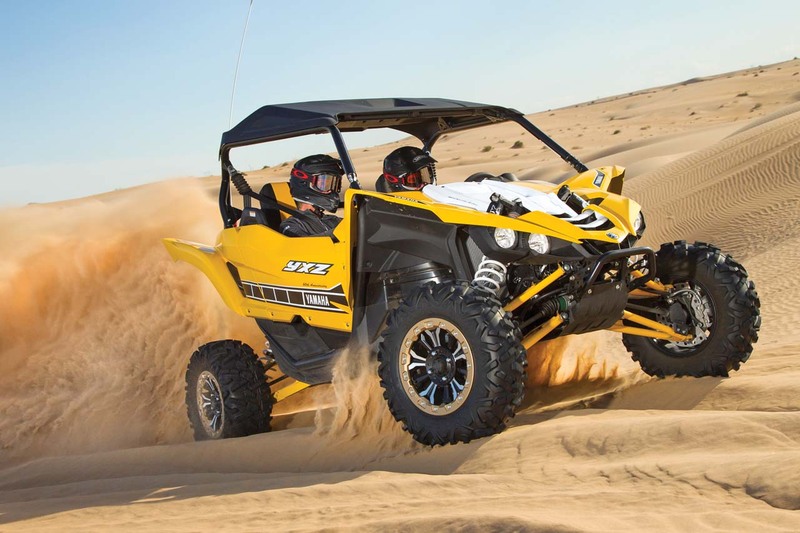 Exterior styling on the YXZ 1000R definitely draws inspiration from the Yamaha sport ATV lineup with sharp, aggressive lines. The front shocks poking through the hood present a different look, but definitely point towards its sporty nature. We also love the doors which fit and close well, and Yamaha even had the bright idea to place a small arrow on the door top to show you where the release lever is on the inside. It's little details like this that make a great complete package. We are usually quite critical of extra vibration whether from the engine or the driveline -not so much with the YXZ 1000R. When you fire up the three cylinder engine, it gives a sound like nothing else, but you can also feel it. We found this a little odd because in their snowmobile lineup, Yamaha’s three-cylinder engine is known for being well-balanced. However, some of the vibration may come from a complicated driveline that places the transmission between the seats for better weight balance. In effect you have dual drive shafts at some points, and extra rotating parts are always a concern for vibration. 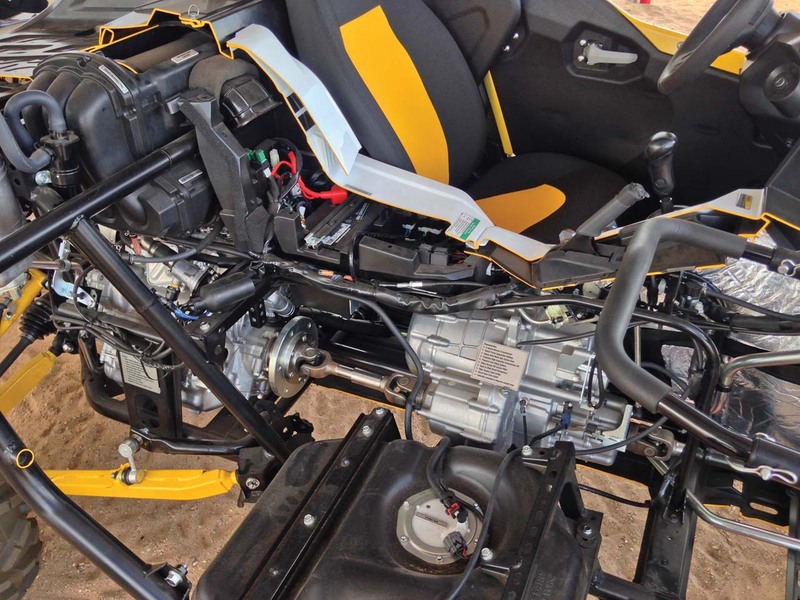 Like every engine, the YXZ 1000R motor has a range where it balances itself out, and for this motor that seems to be anything north of 5500 RPM. It takes a little practice to rev the engine seemingly to the moon as you scream past the shift points for practically everything else you’ve ever driven, but the YXZ is unlike anything else. The howl and the performance are intoxicating and not to be forgotten anytime soon. Any sins of vibration are overlooked when you grip it and rip it! The most important feature on any sport machine isn’t the engine, it's the suspension. 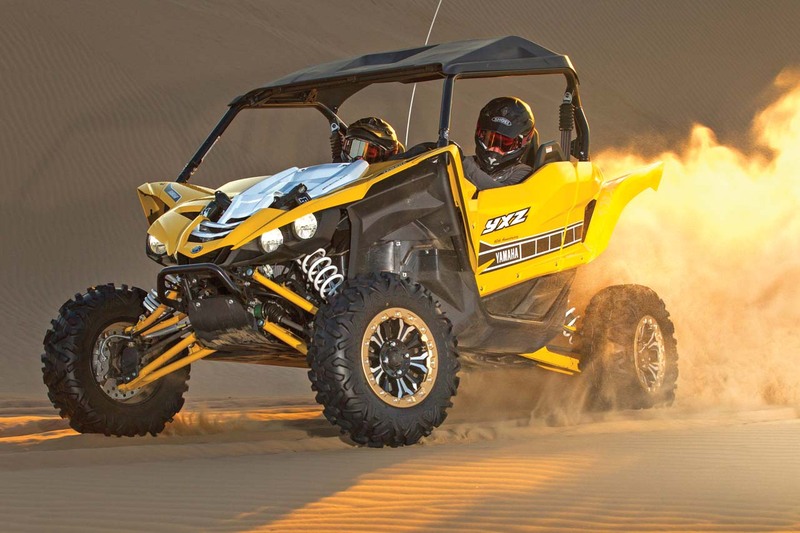 On the YXZ 1000R, Yamaha designed an excellent suspension and it handles great. During our first ride we thought, “This thing is a go kart for the sand,” and that is exactly what it feels like. It feels low and nimble even though it has great ground clearance. The large body, long travel shocks soaked up anything we hit including big G-outs at the bottom of dunes that usually spike your back. Not with the YXZ 1000R. We clenched our cheeks and drove right through them. 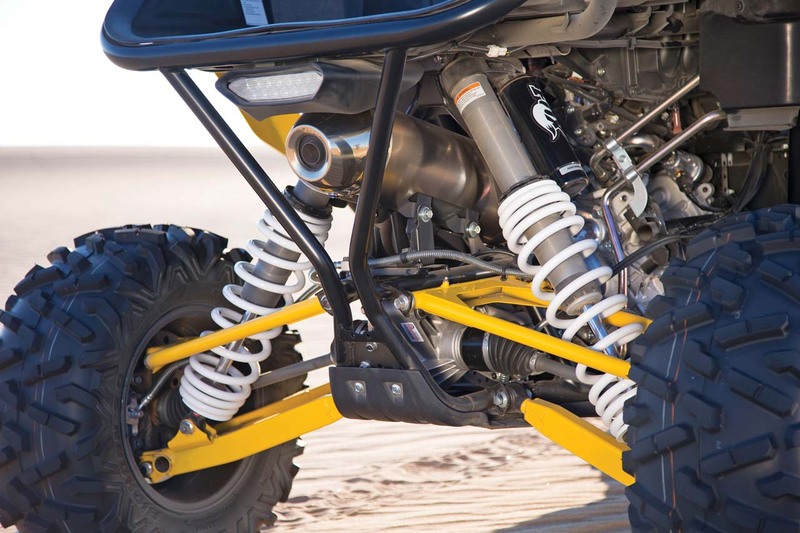 The rear suspension on the YXZ 1000R is a bit of a cross between a five-link suspension, and a trailing arm style suspension. The advantage is very consistent geometry through the shock stroke. Again large body, long travel shocks were used and they are fully adjustable just like the fronts. 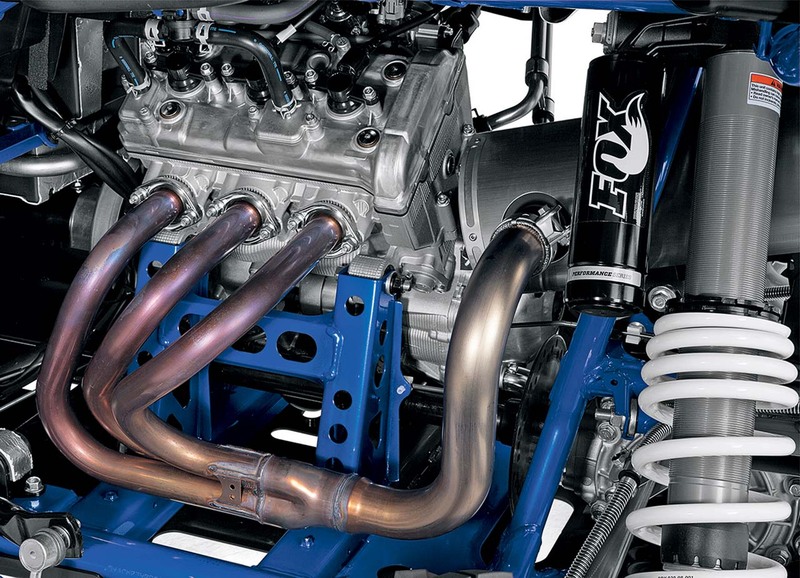 Yamaha mounted all of this on a sturdy, steel tube chassis made from high-strength steel. It’s a very solid, great handling design all the way through and we like it. If you’re going to rip across the sand at the speeds this thing is capable of, you had better have a great handling chassis. 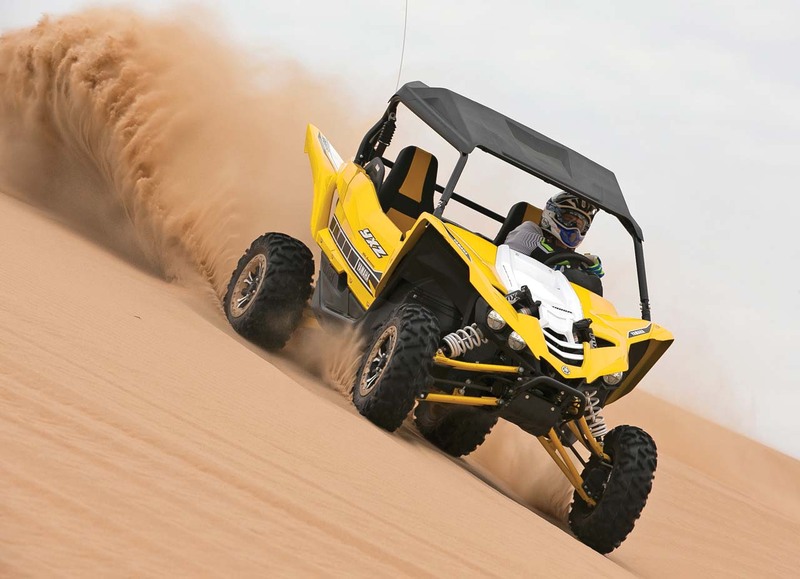 On the sand or the trail, the new YXZ 1000R responds very well to input from the throttle or the steering wheel. It begs you to dart between obstacles and it likes to be driven at about 8000 rpms. It also holds its line very well. We hammered through whoop sections trying to find its limits and it never swapped to either side. Thankfully, the stock shocks are fully adjustable and while the stock settings were a little soft and seemingly refused to bottom, they also had us plowing into whoops rather than skipping across the top. Adjusting the compression and rebound changed that in a hurry. From both the driver and passenger seats, the ride is exhilarating. It can also be hot. With the transmission mounted underneath the cowling between the seats and the radiator ducting some of the hot air down the same tunnel, your legs can definitely get warm on hot days. Like we said earlier, though, this is a race car for the sand and we’re willing to put up with it as a trade-off for outstanding performance. As for top speed, we managed to get 53 mph from 3rd gear, 69 in 4th, and 5th is anybody’s guess. Whatever it is, you’re going to like it! 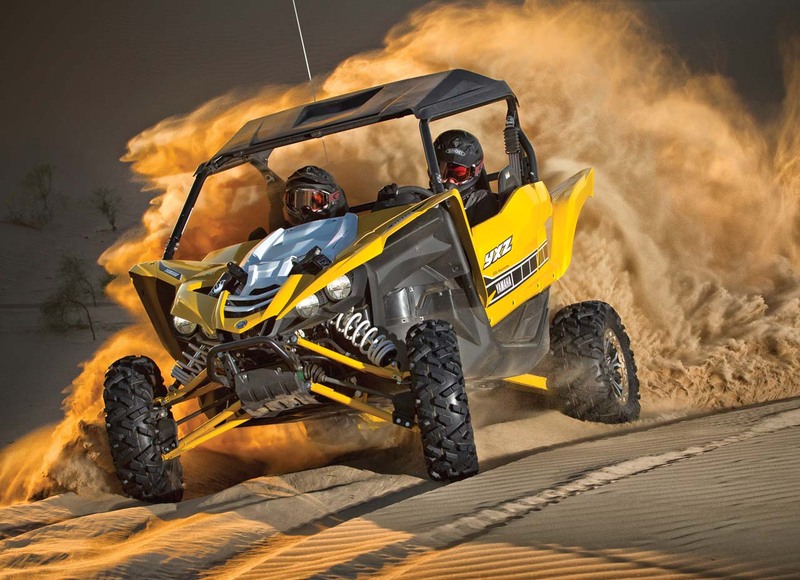 BMW likes to say their cars are a “driving machine.” They had better make room for another because so is the Yamaha YXZ 1000R. It’s not perfect, and it has a few quirks like extra heat and vibration that come with a radical new design, but it’s very, very well made and it’s a Side x Side you won’t get bored in. For years Side x Side lovers who live on the sporty side have been waiting for a manufacturer to release a no excuses, winner takes all sport machine. 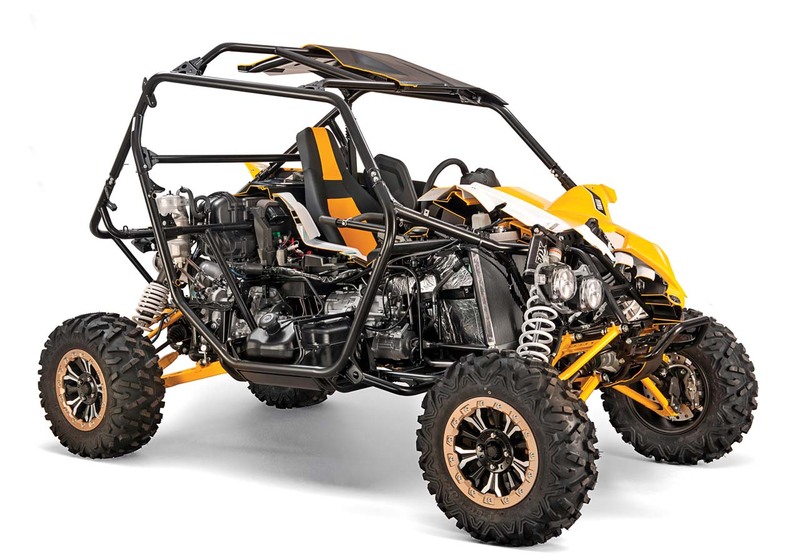 Yamaha is surely late to the game, but it makes sense they would be the one to break down that door since they’ve long had a firm commitment to dedicated sport and competition machines in their ATV lineup. 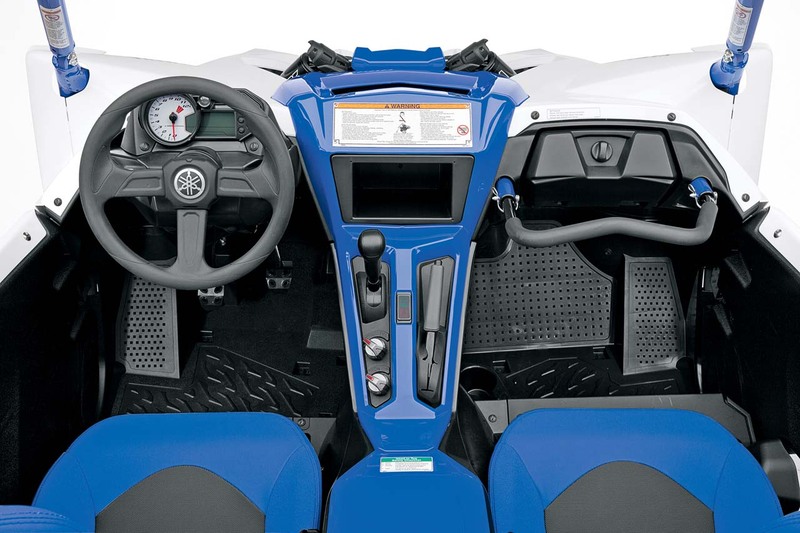 The YXZ 1000R is the equivalent machine in their Side x Side line. It’s the one we’ve been waiting for.